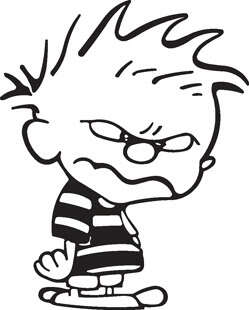 I generally dislike negativism, although admittedly I am not a very optimistic person. I try to hide it well, though, and keep my assessment of everything that will might go wrong to myself. HOWEVER, the weather lately has pushed me to a dangerous edge, so I shall pout, whine, complain and be generally unpleasant to fellow human beings. We have rain, then thunderstorms, then more rain. When there’s no rain, we have cloudy skies. The temperature rarely reaches 75 F, but when that happens I am expected to be cheerful, walk around smiling. Not happening. 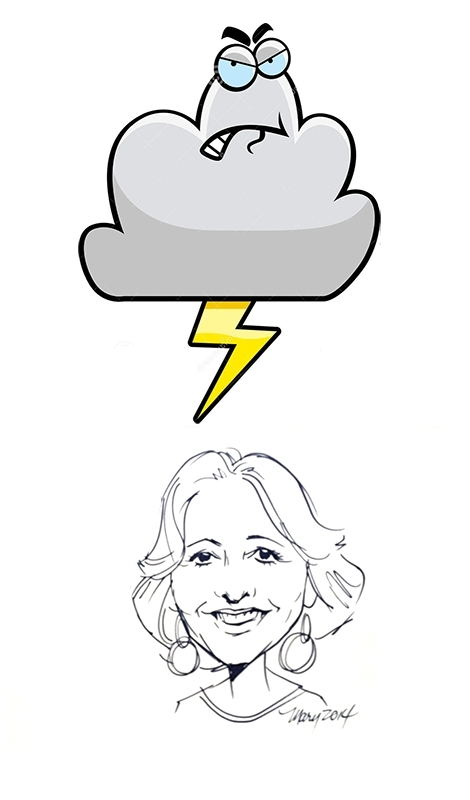 Given the bizarre meteorological situation I’m stuck with, I am blogging on soup. Soup. Hot and soothing. In May. I know, pitiful. Heat the olive oil and butter in a pan, add the shallots and saute until translucent. Add the pieces of squash and cook for 7 to 10 minutes in medium heat. Season lightly with salt and pepper. Add the tarragon, chicken stock, and lemon juice. Mix well, cover the pan and simmer for 10 to 15 minutes. Off the heat, add the heavy cream and nutmeg, transfer the mixture to a blender and process until smooth. Alternatively, you can reserve some of the pieces of squash to add later, for texture. Serve right away with chives (or fresh tarragon) on top. Comments: For those who don’t know, Fer is a Brazilian food blogger who’s been living in the US probably as long or even longer than me. She was also my number one inspiration to start the Bewitching Kitchen, so it feels special to blog about a recipe from her site… Fer shared a post about this soup not too long ago, but my intention was to make it in the fall, when the weather would be more appropriate for it. However, the universe conspired against me. We are at the end of the month of May. I’ve been unable to wear shorts or flip-flops. End of May. I had to bring a jacket from storage on more than one occasion. I wore boots three times this month. So there you have it, Yellow Squash Soup for lunch. At least I can testify that it’s delicious! 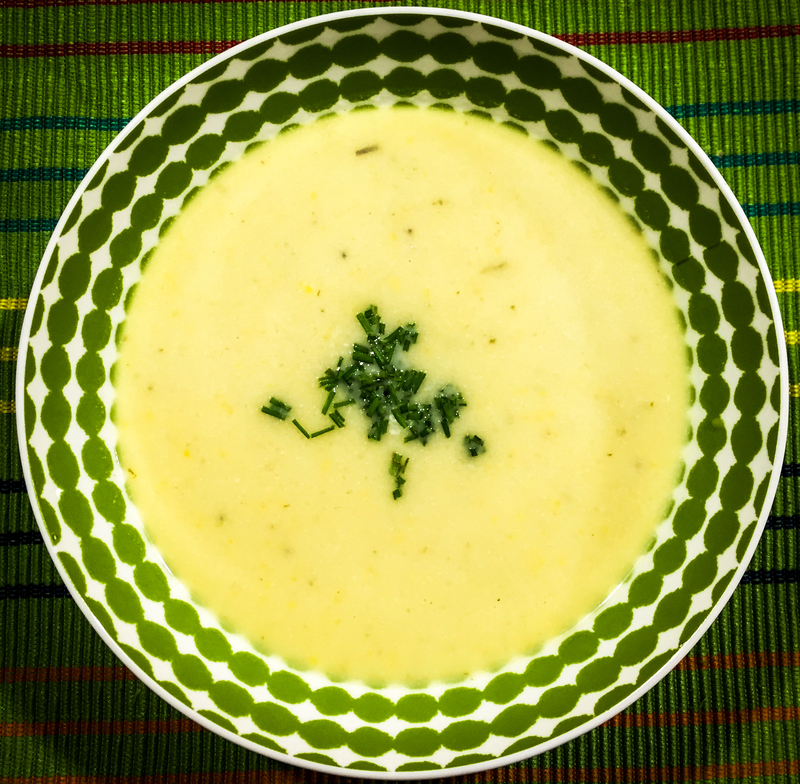 This soup will be a regular appearance at our kitchen, and in my next time – when October comes – I intend to use coconut milk instead of heavy cream, just because I think it will be awesome that way too. If you are faced with adverse meteorological conditions, make this soup, it is bright yellow like the sun that should be shinning outside. When Phil and I sat down to plan the menu for our recent reception, the first thing he suggested was focaccia. Why? Because it is a crowd pleaser and I can make it in my sleep. But Sally’s mind works in mysterious ways. Instead of sticking with my tried and true recipe – the focaccia I blogged about when the Bewitching Kitchen was only 5 days old – I decided to try a completely new recipe. What enticed me was its overnight rise in the fridge and with it, the promise of a sharper, more complex flavor. Big risk? Maybe. But, I am here to share with you great news: I like this version even better than “the old one”. The texture turned out perfect, and the taste was just the way I like it, with a very subtle hint of sourness, but mild enough that the focaccia paired well with all sorts of cheeses and dips. The recipe published in Fine Cooking, comes with a big name behind it, Peter Reinhart. He knows his way around bread, and this formula proves the point. The day before baking, mix the dough and let it spend the night in the refrigerator. Combine the flour, water, sugar, salt, and yeast in the large bowl of a stand mixer (use the paddle attachment, not the dough hook). Slowly mix until the ingredients form a ball around the paddle, about 30 seconds. Switch to the dough hook and mix on medium low for another 3 minutes. Stop the machine to scrape the dough off the hook; let the dough rest for 5 minutes and then mix on medium low for another 3 minutes, until it’s relatively smooth. Coat a bowl large enough to hold the dough when it doubles in size with 1 Tbs. of the olive oil. Transfer the dough to the bowl and rotate the dough to coat it with the oil. Hold the bowl steady with one hand. Wet the other hand in water, grasp the dough and stretch it to nearly twice its size. 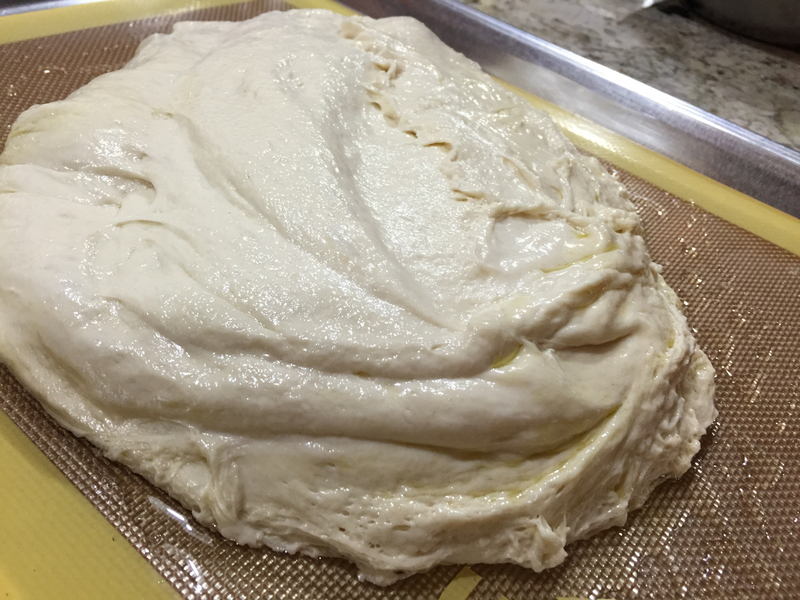 Lay the stretched section back over the dough. Rotate the bowl a quarter turn and repeat this stretch-and-fold technique. Do this two more times so that you have rotated the bowl a full 360 degrees and stretched and folded the dough four times. Drizzle 1 Tbs. of the olive oil over the dough and flip it over. Wrap the bowl well with plastic and refrigerate it overnight, or for at least 8 to 10 hours. 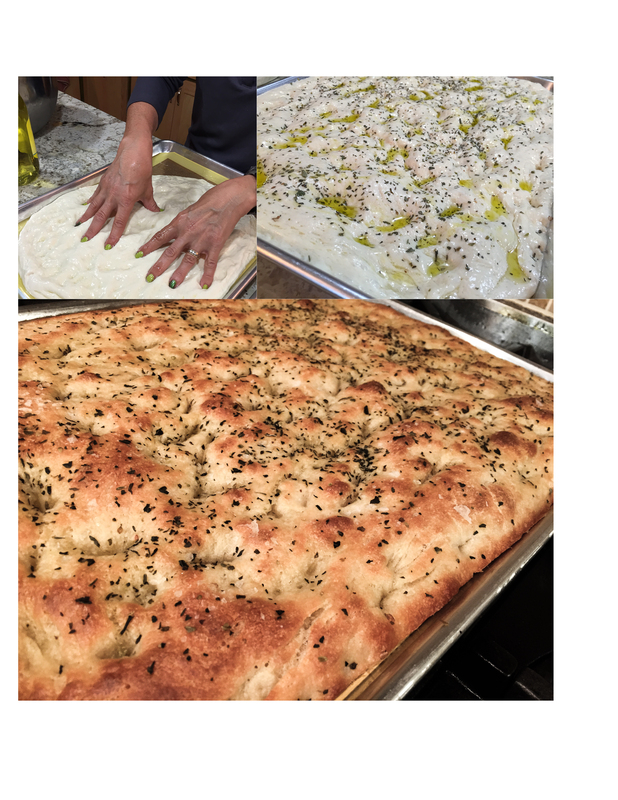 Shape the focaccia: Remove the bowl of dough from the refrigerator and start shaping the focaccia 2 to 3 hours before you intend to bake it. The dough will have nearly doubled in size. Cover a 13×18-inch rimmed baking sheet with parchment or a silicone baking mat and coat the surface with 2 Tbs. of the olive oil. Gently slide a rubber spatula or a dough scraper under the dough and guide it out of the bowl onto the center of the pan. Drizzle 2 Tbs. of the olive oil on top of the dough. Dimple the entire dough surface, working from the center to the edges, pressing your fingertips straight down to create hollows in the dough while gently pushing the dough down and out toward the edges of the pan. At first you might only be able to spread the dough to cover about one-half to three-quarters of the pan. Don’t force the dough when it begins to resist you. Set it aside to rest for 20 minutes. The oil will prevent a crust from forming. After letting the dough rest, drizzle another 2 Tbs. olive oil over the dough’s surface and dimple again. This time, you will be able to push the dough to fill or almost fill the entire pan. It should be about 1/4 to 1/2 inch thick. If it doesn’t stay in the corners, don’t worry; the dough will fill the corners as it rises. Cover the dough loosely with oiled plastic wrap, put the pan on a rack to let air circulate around it, and let the dough rise at room temperature until it’s about 1-1/2 times its original size and swells to the rim of the pan. This will take 2 to 3 hours, depending on the temperature of the room. Thirty minutes before baking, heat your oven to 475°F. 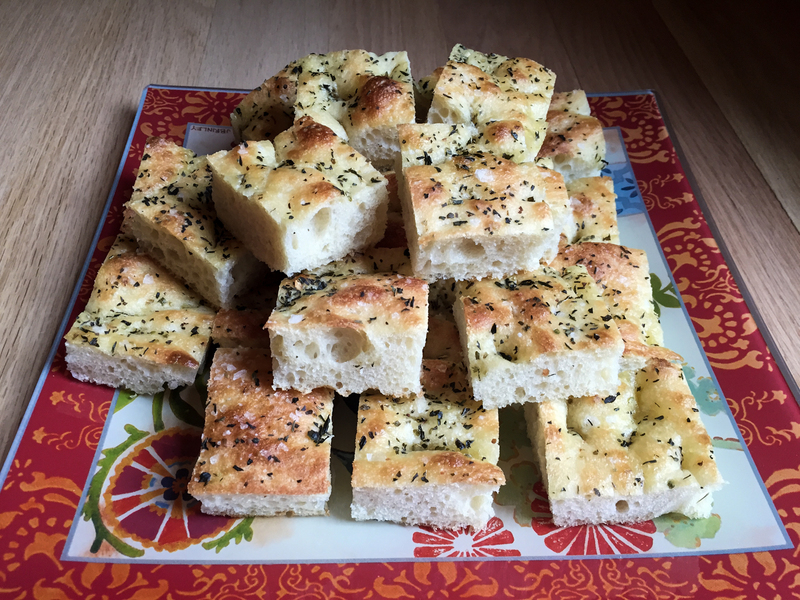 Bake the focaccia: Just before baking, gently remove the plastic wrap and sprinkle a few pinches of salt and dried herbs of your choice over the dough. Put the pan in the middle of the hot oven and reduce the heat to 450°F. After 15 minutes, rotate the pan to ensure even baking. Set a cooling rack over a sheet of aluminum foil or parchment (to catch drippings). Use a metal spatula to release the dough from the sides of the pan. Slide the spatula under one end of the focaccia and jiggle it out of the pan onto the rack. 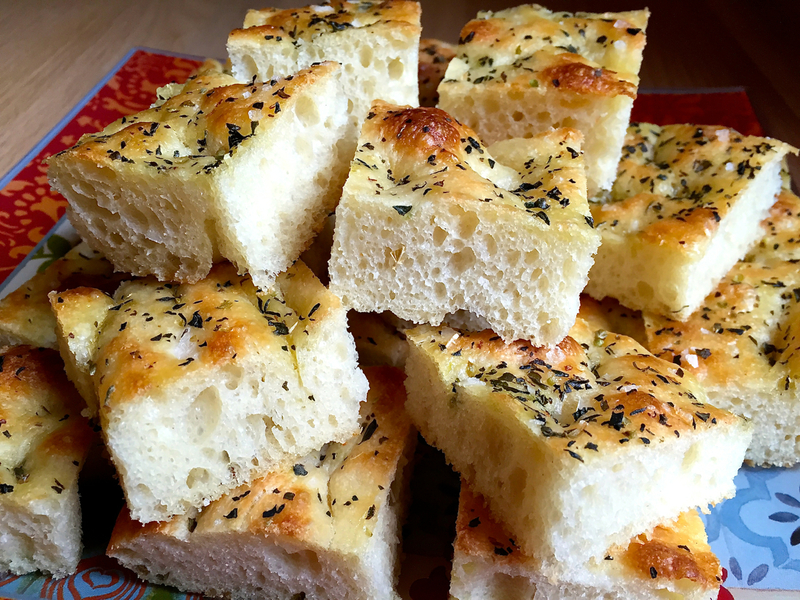 If any oil remains in the pan, pour it evenly over the focaccia’s surface. Carefully remove the parchment or silicone liner from beneath the focaccia. Let cool for 20 minutes before cutting and serving. This dough was a pleasure to work with! I highly recommend this recipe if you have yeast-phobia, because it is simple, straightforward, and it will work perfectly no matter your skill level as a bread baker, I promise. If I had extra time, I would have made a rosemary-infused oil, but the dried herbs worked very well. You can use dried oregano, dried thyme, or get a mixture ready to use as I did. Fines Herbes, Herbes de Provence, they can all work well topping the focaccia. SO, WHERE IS THE THRILL? Did you call me, Mom? The Saturday before our reception was one of my busiest cooking days ever. Still, when I took the focaccia out of the oven, I decided to do a quick run to the recycling center, to dump our glass waste. Buck is my buddy for these outings, the only one who likes to ride in the car with me (Oscar has the shakes whenever faced with a drive). Got there early, no one around, so I mentally patted myself on the back: “Great job, Sally, you can park right by the glass container spot, in and out in 30 seconds. You rock!” So I got off the car and left the engine running, my handbag inside with Buck. Rush out, rush back, done! Done? Not so fast. It was more like “rush out, rush back, shock and horror! The doors were locked! Buck must have jumped on the switch when I left and locked them. If you lock one side from the inside, both doors get locked. I know, perverse technology. Big, huge shiver up and down my spine. The drama unfolded as I entered the recycling office in complete panic, barely able to form complete sentences, begging to use their phone to call for help… This HUGE guy sweet as a teddy bear said “maybe I’ll be able to help you….” – and he comes out with a bunch of gadgets worthy of a professional burglar… a little inflatable black plastic bag that he pushed through the door and pumped just enough to get a little opening, then a big wire – he manipulated it like a pro to hit the control to bring the window down. Of course, Buck is going NUTS inside, in complete disapproval of that humongous human being next to his Mom and messing with the pickup truck…. We are ready to party! What about you? 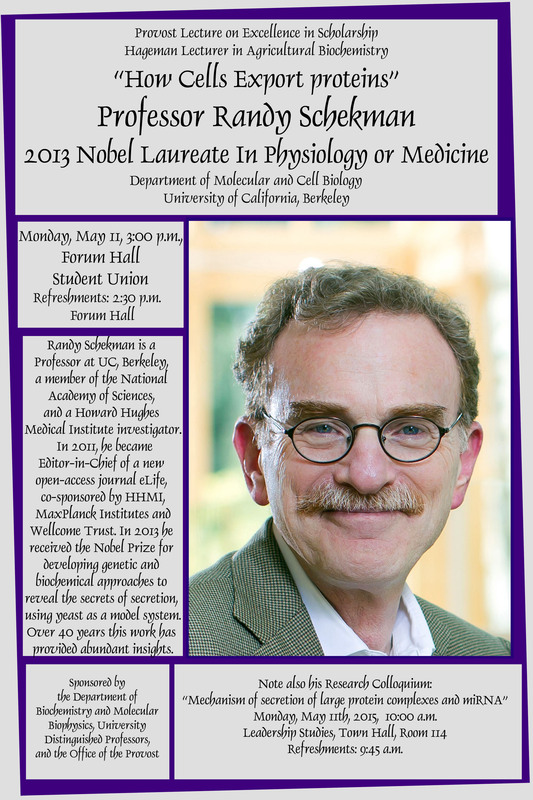 As I mentioned earlier, we hosted a very important event in our home: a reception to honor Dr. Randy Schekman, winner of the 2013 Nobel Prize in Physiology or Medicine. I actually have a little gift for my readers. If you want to listen to one of his seminars, click on this link. Randy opened this talk with amusing stories about his life and how he first became interested in science. This particular seminar was open to the public and will appeal to anyone. He is not only a great speaker, but also very personable. It was one of the best scientific visits we had in our department. Since the reception took place on a Monday evening, I could do most of the work in the weekend. Apart from store-bought items (crackers, cheeses, charcuterie items, black olive tapenade, and fresh fruits), here is the list of what I prepared. 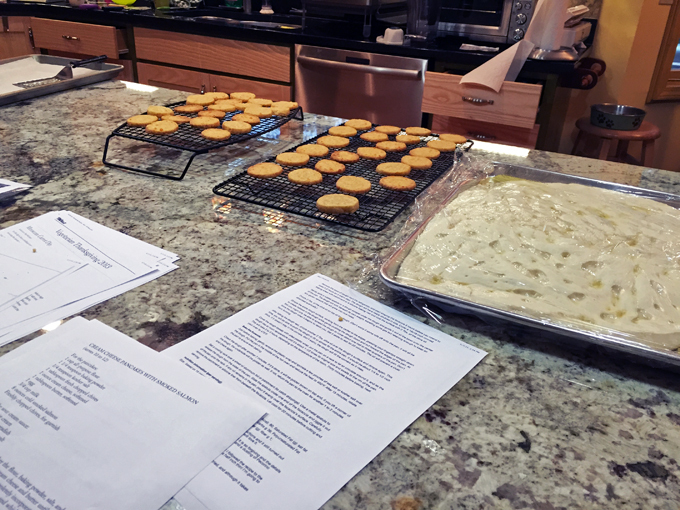 I spread the preparation over the two preceding days, freezing focaccia (cut in squares), cheddar crackers, and mini-pancakes on Saturday. That worked very well, I removed them all from the freezer at lunch time on Monday and refreshed them briefly in a 250 F oven a couple of hours before serving, or in the case of the mini-pancakes, before assembling them with the dill cream and the salmon. One hour before the reception started I baked the Bacon-wrapped dates and the Meyer Lemon Ricotta. Saturday afternoon… We are headed to the freezer! Suzanne Goin’s bacon-wrapped dates: delicious! In fact one of the guests told Phil that he would like to stand by the platter and inhale them all as dinner. They were a perfect mixture of sweet and savory, with the sharp bite on Parmigiano to crown it all. 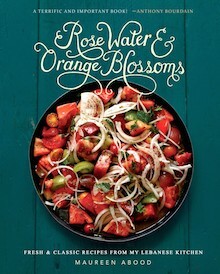 I have a cookbook recommendation for you: Rose Water and Orange Blossoms, by Maureen Abood, who runs a gorgeous food blog I’ve been following for a while. As I browsed through my Kindle version, I was surprised by the number of recipes I bookmarked, a feature I love in the Kindle reader, actually. Makes it so easy to go back to favorites. So I did that A LOT. I also love when a cookbook mixes just the right amount of prose. Don’t make each recipe a reason to pour your soul out and tell me all about your childhood and that of your close friends, but give me enough to dream about, to make me understand why that recipe is special for you, special enough that you chose to include in your cookbook. Maureen does just that. The first recipe I made from her cookbook is simple yet very elegant. 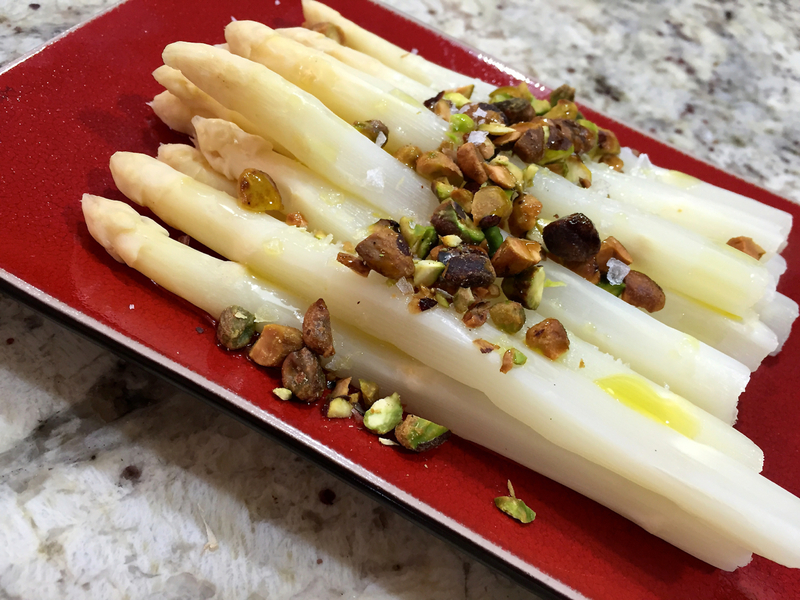 Poached white asparagus with pistachios. She used pistachio oil to drizzle the dish, I decided to go with my recent acquisition, a blood orange-infused olive oil. 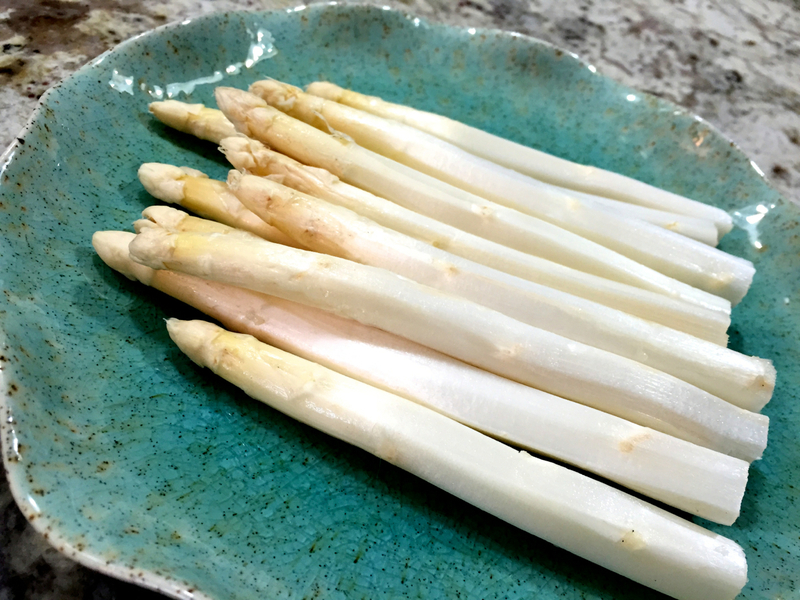 I am quite fond of its color, a soft reddish tone, and I think the taste matched the white asparagus very well. Trim the asparagus by snapping the ends off at their natural break. Peel them from just beneath the tip to the end with a vegetable peeler. Cover the asparagus with water in a large sauté pan. Squeeze the lemon into the pan and add the teaspoon of salt. Cover the pan and bring the water to a boil, and then reduce the heat to medium-low and simmer for about 20 minutes, or until a spear can be easily cut with a knife and fork. Drain and set the asparagus aside to cool. Remove the thin papery skin on each pistachio to reveal the bright green nut underneath by rubbing the skin off of each nut between your fingers and thumb. Coarsely chop the pistachios. Divide the asparagus among four individual salad plates, or pile them, all facing the same direction, on a platter. Sprinkle the pistachios across the center of the asparagus crosswise, forming a line. Drizzle everything with pistachio oil, and finish with the sea salt. Comments: White asparagus will always make me think of a trip to Germany many years ago. We were living in Paris at the time, and went for a little scientific mission to a couple of cities in Germany. We arrived at the peak of asparagus season and one restaurant in particular had pretty much all dishes centered on them. I still remember a gratin of white asparagus and ham that blew my mind, it was superb! Until I got Maureen’s book, I confess to butchering my share of white asparagus when trying to cook them at home. It never occurred to me that these pale white creatures need to be treated differently from their siblings, the ones allowed to grow under full sun. Maureen gives two simple tips for success: peel them all the way from the bottom to the region right below the tips. And cook them gently but for a longer time. I was amazed at the difference these two little modifications brought to my culinary life. Now, back to Maureen’s book. So many dishes I want to cook from it, it’s not even funny… Doesn’t “Flower Water Syrup” make you go in a dreamy daze? Many of her recipes are simple but join unexpected flavors, leaving you with that feeling of “why didn’t I think of that?” For instance, Warm Dates with Almonds and Lime Zest… I just know it will be an amazing recipe. Or… Tahini Avocado? Za’atar Roasted Tomatoes? It all sounds perfect. And to me, nothing is better than a great kibbeh, I love it. She shares her classic version of Baked Kibbeh, and one particular recipe I had a few times in Brazil and find spectacular: Yoghurt-Poached Kibbeh. You may think it is strange, but trust me, it is the best kind. I guess I was lucky to grow up in São Paulo where we have many great Lebanese restaurants, some pretty close to the university where I studied. Still on the kibbeh front, Maureen offers several variations that were unknown to me: Fried Kibbeh with Mint Butter, Vegan Tomato Kibbeh, and Potato & Spinach Kibbeh. But I will tell you what will be my next recipe for sure: Whipped Hummus with Minced Lamb. One little tip she gives in that recipe is worth my weight in chickpeas. But I share no more. You will have to invite her book to join your collection, and that will be a very wise move. Go for it with a simple click here. 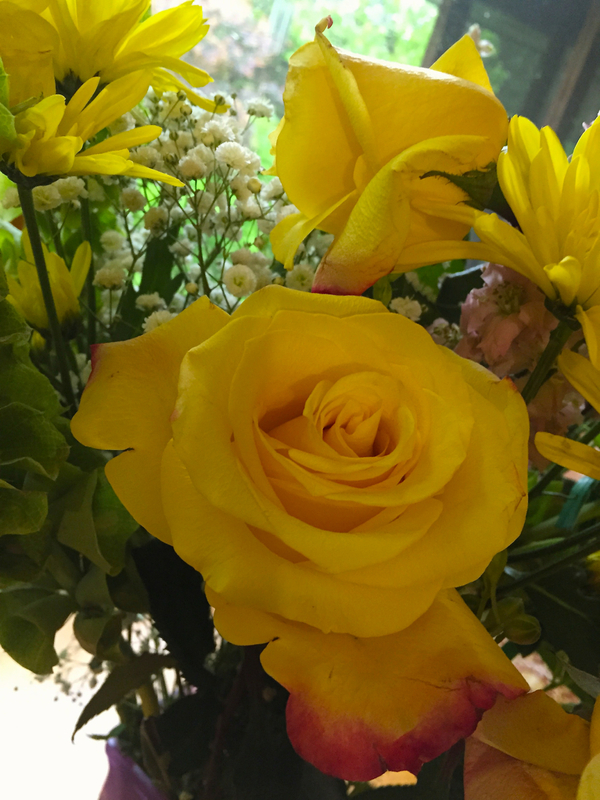 Maureen, thank you for allowing me to publish your recipe, and best of luck with your cookbook! If you are into Paleo recipes, make this dish! 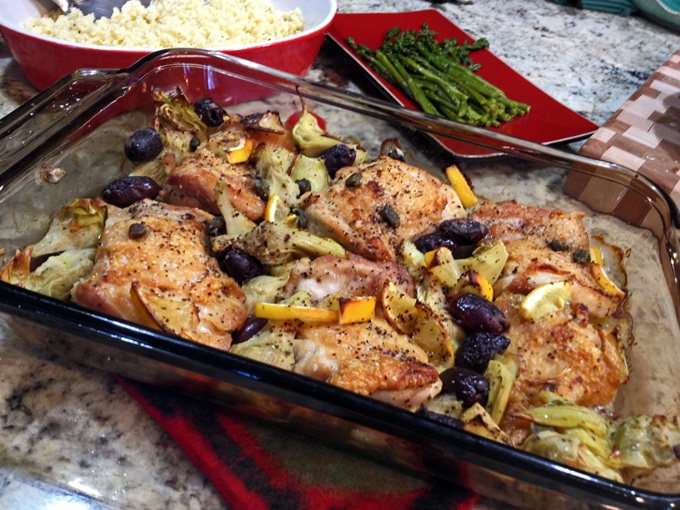 If you are not into Paleo recipes, make this dish! Yes, I am a bit bossy today, as a husband and a few graduate students might have noticed. But it’s all with good intentions, as I know what is good for them, for you, and maybe even for myself. 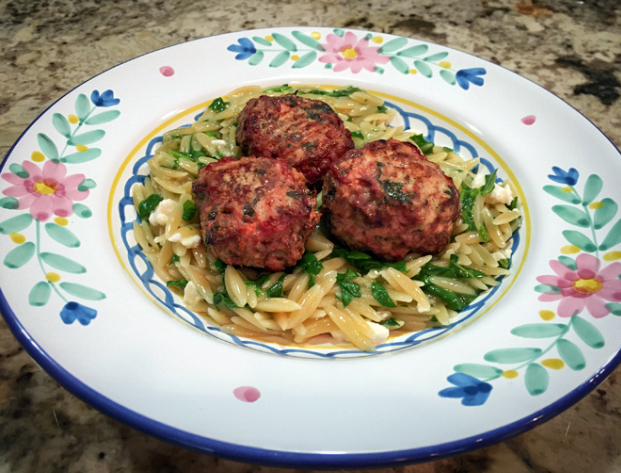 The inspiration for this recipe was found in one of my Kindle cookbooks, Make it Paleo II, by Hayley Mason and Bill Staley. They also have a food blog, Primal Palate, with great recipes and youtube videos. I always read the good and the bad reviews of a cookbook before buying it, and one of the reviewers at amazon.com said that this recipe alone was worth getting the book. I made it twice, once exactly as written, but in this post I am sharing my take on it, modified not only in flavor but also in the method itself. In their version, it is all made in a single skillet, but I did not want to turn on the big oven, so after browning the meat I transferred the pieces to a baking dish that fits in our Breville. Heat the oven to 425°F. Heat a skillet or cast iron pan over medium heat. Pat the chicken thighs dry with a paper towel, removing as much moisture as possible. Season the skin with salt and place them skin side down in the hot skillet. Flip the thighs once they develop a nice brown sear on the skin, which should naturally make them easily release from the pan. Cook the chicken skin side up for 1 minute, then transfer to a baking dish, skin side up. Season evenly with the oregano, za’tar, and more black pepper to taste. Add the artichoke hearts, olives, capers, and lemon slices to the skillet. Place the skillet in the oven and roast for 30 to 35 minutes, until the chicken is fully cooked. Comments: If you never de-boned a chicken thigh yourself, take a deep breath and try it, because it’s a nice skill to acquire in the kitchen. I don’t know what type of chicken meat your grocery store carries, but where we live I can find bone-in, skin-on chicken thighs, and boneless, skinless. The former I use for roasting all the time, but the skinless I reserve for either braises, stir-fries, or grilling (usually after a nice marinade with yogurt or some citric concoction). You absolutely need boneless pieces with the skin on for this recipe, so if you cannot find it, roll your sleeves up and get working. It was a bit of a struggle, but I got better and better as I did it. I watched some videos on youtube to help me with the technique, but most videos available show professional chefs who handle the knife as if they were born with one in their hands. Amazing to watch, but when trying to mimic them, my shortcomings became quite evident. I say take your time, put some soothing music on, and practice. By the way, if you don’t have za’tar, don’t worry. But get some, will you? I must say it’s one of my favorite spice mixtures at the moment. Love it. Phil is so addicted to my default recipe for chicken thighs, that at first he was disappointed by the different preparation. But, it took him only one bite to say that I should revisit this recipe whenever I feel like it. Two thumbs up! So there you have it, make this dish because I said so, and Sally knows what’s best for everyone. HA!